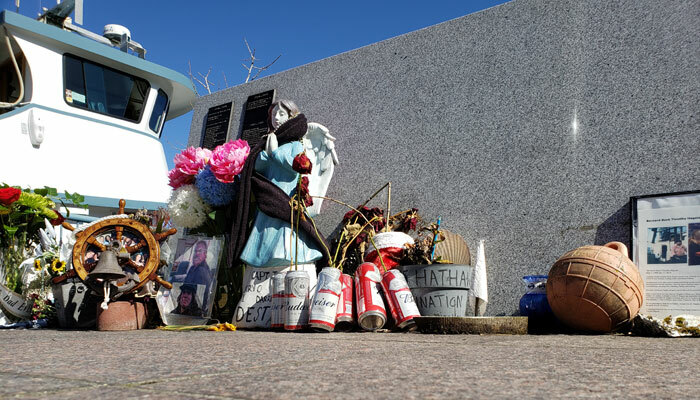 Photos by Brandon Macz: An informal shrine for those lost at sea was set up near the Fishermen's Memorial for the 91st Blessing of the Fleet at Fishermen's Terminal on Sunday, March 17. Seattle Assistant Police Chief Stephen Hirjak chats with Ballard First Lutheran Church Pastors Erik Wilson Weiberg and Elise Scott prior to the ceremony. Pastor Elise Scott is joined by local political leaders in singing a hymn during the Blessing of the Fleet ceremony. Saaduuts Peele, a Haida Nation master carver, performs the Eagle's song. The Admiral owner Tom Meiners accepts the Christ pennant from Ballard First Lutheran Church Pastor Erik Wilson Weiberg. 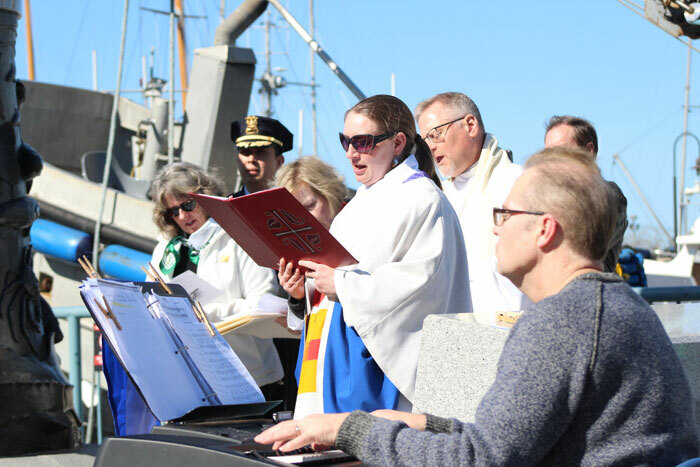 Blue skies made a rare appearance during this year’s Blessing of the Fleet ceremony at Fishermen’s Terminal. 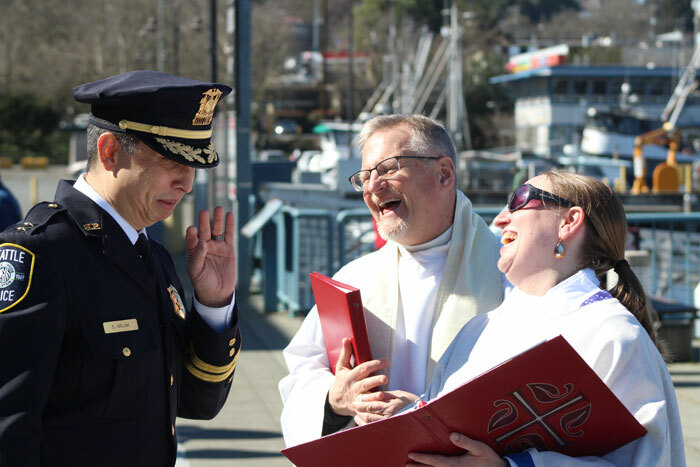 Ballard First Lutheran Church Pastors Erik Wilson Weiberg and Elise Scott conducted the 91st Blessing of the Fleet on Sunday. 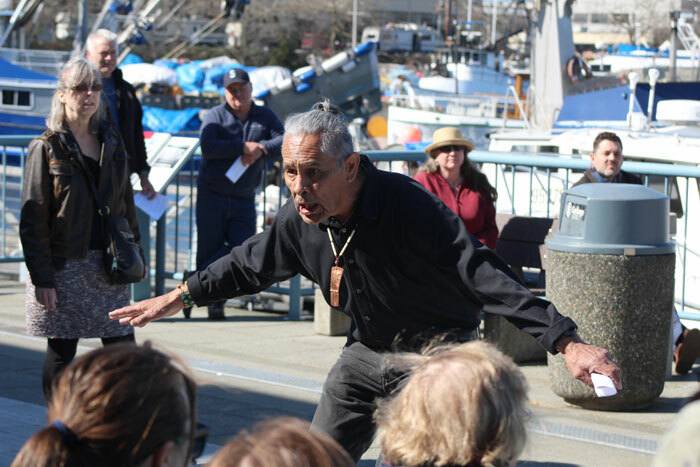 This was Wilson Weiberg’s 23rd blessing ceremony, which he said offers prayers that the commercial fishers leaving for Pacific and Alaskan waters have safe travels and a happy reunion, that their harvests be fruitful, and that they be good stewards of the ocean’s resources. “Those three, we see them all as equally important,” Wilson Weiberg said. 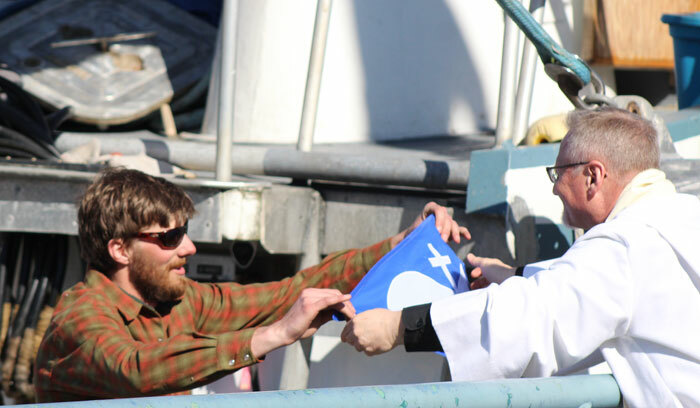 With the Fishermen’s Memorial as the backdrop, the pastors and members of their congregation took turns offering prayers and songs, while local leaders spoke of the importance of the commercial fishing industry in Seattle. “There’s generations of folks that have been involved in fishing in this area that understand the significance the fishing industry has in this region and the economic prosperity in this area,” Delmas Whittaker tells the Queen Anne News. He began managing operations at Fishermen’s Terminal in early 2018 and serves on the Fishermen’s Memorial board. From those in the fleet that will head out to sea in the next two months to the people manufacturing the gear in their boats, the commercial fishing industry provides around 16,000 jobs and a $1.3 billion payroll within the Port of Seattle, said Position 4 Commissioner Peter Steinbrueck. Commercial fishing has been going strong in Seattle for a hundred years, and there’s also a long history of too many accidents and injuries, said Hirjak, the Fishermen’s Memorial towering above him. The memorial honors the lives of 675 lives lost at sea, and on Sunday there was laid nearby a number of photos of the departed, flowers, beer cans, a statue of an angel and other personal items. Hirjak recounted once stopping a fisherman with expired tabs, having been away for months on a boat. The man asked him a lot about his job as he wrote the ticket. “He told me that he wanted to look at safe work like a policeman rather than fishing,” Hirjak said. Washington 36th District Rep. Gael Tarleton has lived in Ballard since 1990, and spent five years on the Port of Seattle Commission. Lawmakers are crossing the aisle in Olympia to find ways to get youth excited about the state’s maritime industry, she said, and to help them acquire skills they can use to fish the seas, build the ships and manufacture the gear to support it. “I feel like we are in an important time when we try to think about what is most important to us,” Tarleton said. Saaduuts Peele, a Haida Nation master carver, said his tribe sings songs for the salmon and halibut, and that people run through the village alerting others when sockeye can be seen from the shore. Part of the March 17 blessing focused on the importance of sustainable fishing, which Peele’s tribe had been practicing long before there was a word for it. Peele then sang the Eagle’s song for the crowd, his arms stretched out like wings, as he ducked and glided around the plaza. 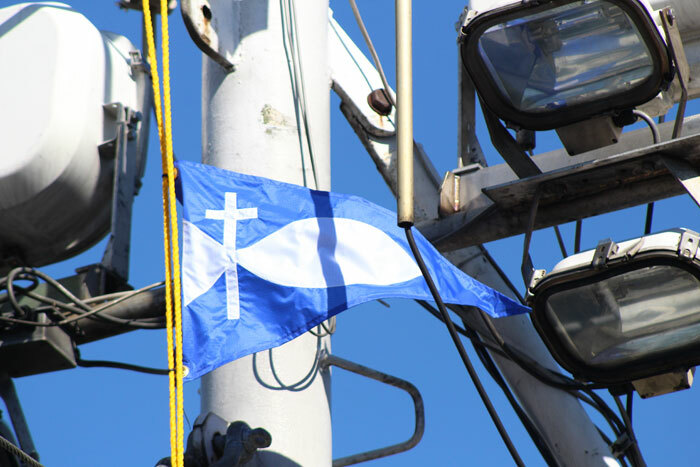 The 91st Blessing of the Fleet was capped off with the blessing of Tom Meiners’ boat, the Admiral, and the raising of the Christ pennant. Meiners started fishing with his father when he was 15, and then spent 11 seasons fishing salmon in Alaska for a friend before he bought the Admiral. He tells Queen Anne News the pennant had him feeling more confident about his chances when he heads out this season, and he hopes other fishing boats don’t follow him for luck. 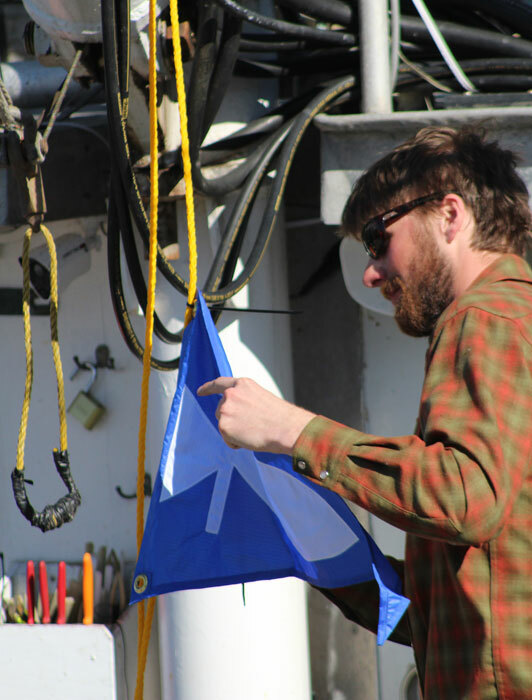 To bless every boat in Fishermen’s Terminal would be an impossible task, Wilson Weiberg said, but the idea is that the pennant will share its blessing as it passes them by. “There’s going to be a lot of movement here in the next few weeks,” Whittaker said.